The Sunshine Space: Project Life: January. I've been scrapbooking for a long time. I think I started at the end of middle school, maybe start of high school? Either way, documenting and recording my life through pictures and words has been a big part of my daily happenings for many years. 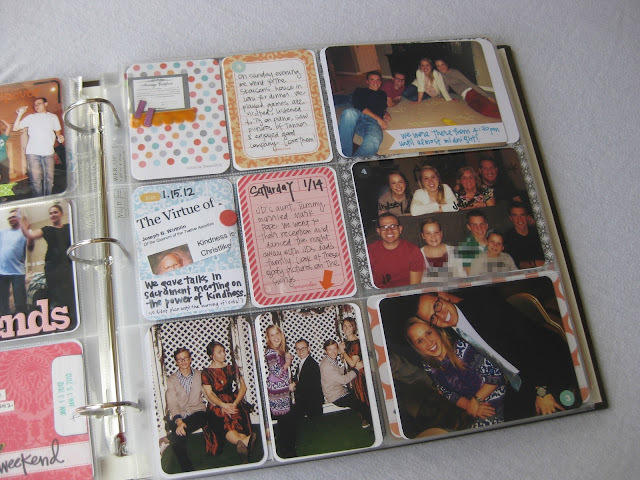 Lately, I've been in a bit of a scrapbook funk because I haven't felt very creative or innovative with my pages. I don't like to spend a lot of money on supplies (those embellishments add up so quickly!) and I've let months slip by without printing my pictures. I decided to try something else in 2012. Project Life, created by Becky Higgins, has been just the change I was looking for. You basically order a box set of journaling cards, filler cards, and label numbers and organize your pictures with their stories. I've added some ribbons, stamps, and brads to my album that didn't come in the set because I'm a creature of habit and I like the extra flair. . . but it really is just a very basic approach to storytelling that any one could do. I just print out my pictures at the end of the week and put together a page or two over the weekend. It's easy. No pressure. And I love it. This might be one of my favorite albums so far. Week 1: New Year's Day at New Haven, Girls' night with my friends, dinner date at Goodwood, we spent the weekend helping Brad and Abby move. Week 2: Taking girls out on fun passes, romantic lunch in the middle of the week, breakfast date, Lindsey's arrival to Utah. Week 2, the weekend: Happy visit with Jocelyn, dinner at Red Robin, first married sleepover at Brad and Abby's new place, Stephen got married. Week 2, the weekend, part 2: Sunday dinner at the Skousens, Tammy's wedding, talks in church about the power of kindness. Week 3: Double date with Ty and Lindsey to Nickel City and our day on Temple Square. Week 4 insert: The circus! Week 4: We bought a new iron, Tuesday Temple date, Zupa's for family night. I haven't set any hard rules for myself like a picture every day or only one layout per week. This type of album can be whatever you want it to be. In Becky's words, just cultivate a good life and record it! I've heard of this before but never really knew what it was. It's SO cute!! What a great idea! You are so creative and amazing! I love that scrapbook! i love love these!! 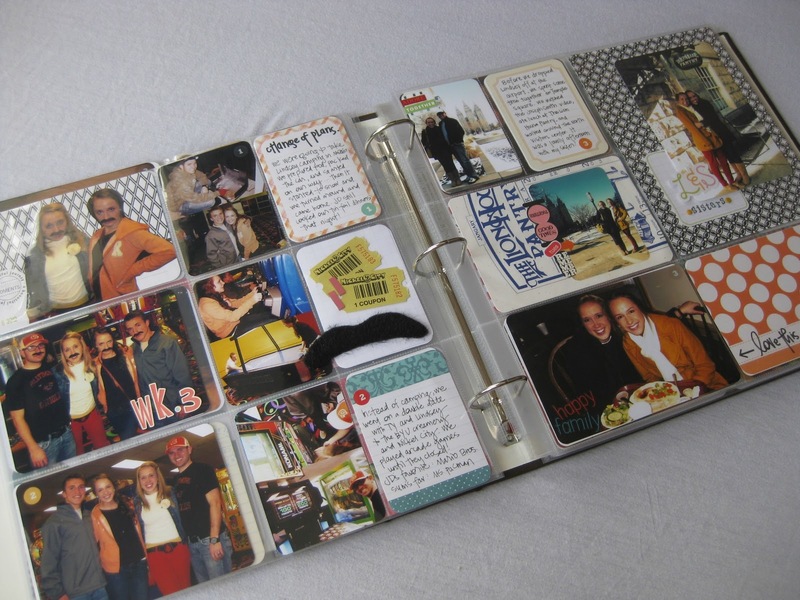 such a good way to scrapbook on a budget! too cute sum.